There are two basic varieties of mozzarella, either of which may be sold whole or already sliced or grated. Usually sold in containers of brine, shaped into delicate balls, or packaged moist, fresh mozzarella can be purchased in Italian specialty shops, cheese markets, and some natural foods and grocery stores. Originally made from the milk of water buffalo, and called mozzarella di bufala, mozzarella is now most often made from cows’ milk, and is referred to as fior di latte. Unsalted varieties, intended for cooking, are nearly sodium free. Salted mozzarella is a good table cheese. Mozzarella also comes in lightly smoked (affumicata) or heavily smoked (scamorza) varieties that add interest to salads and grilled foods. A semisoft cheese of the same type as brick and Havarti, this factory-made variety is drier than fresh mozzarella. It is generally sliced or shredded as a topping for pizzas, and appears in pastas and sandwiches. 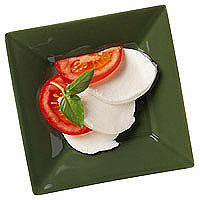 Mozzarella now comes in whole-milk, part-skim, low-moisture, light, and fat-free varieties. However, the low-fat varieties do not melt as smoothly as the whole-milk or part-skim types. String cheese is usually made of semisoft mozzarella.